همت آبادی, حجت, بهروز, ربیع. (1392). بررسی قابلیت استفاده از فرایند الکتروکواگولاسیون با استفاده از الکترودهای آلومینیوم در کاهش TSS و COD پساب کارخانه بازیافت کاغذ. مجله صنایع چوب و کاغذ ایران, 3(2), 53-64. حجت همت آبادی; ربیع بهروز. "بررسی قابلیت استفاده از فرایند الکتروکواگولاسیون با استفاده از الکترودهای آلومینیوم در کاهش TSS و COD پساب کارخانه بازیافت کاغذ". مجله صنایع چوب و کاغذ ایران, 3, 2, 1392, 53-64. همت آبادی, حجت, بهروز, ربیع. (1392). 'بررسی قابلیت استفاده از فرایند الکتروکواگولاسیون با استفاده از الکترودهای آلومینیوم در کاهش TSS و COD پساب کارخانه بازیافت کاغذ', مجله صنایع چوب و کاغذ ایران, 3(2), pp. 53-64. همت آبادی, حجت, بهروز, ربیع. بررسی قابلیت استفاده از فرایند الکتروکواگولاسیون با استفاده از الکترودهای آلومینیوم در کاهش TSS و COD پساب کارخانه بازیافت کاغذ. مجله صنایع چوب و کاغذ ایران, 1392; 3(2): 53-64. هدف از این بررسی ارزیابی بازده کاهش TSS وCODاز پساب صنعتی بازیافت کاغذ توسط فرایند الکتروشیمیایی با استفاده از الکترود آلومینیوم است. عامل های زمان الکترولیز (10، 20، 30 و 60 دقیقه)، pHنخستین پساب (3، 5، 5/7 و10) و ولتاژ (9 و 12ولت) روی بازده فرایند الکتروکواگولاسیون برای تیمار این پساب مورد بررسی قرار گرفت. افزایش زمان الکترولیز سبب کاهشTSS و COD پساب شد. افزایش ولتاژ از 9 به 12 ولت به طور چشمگیری سبب کاهش TSS و COD پساب شد به طوری که میزان کاهش در ولتاژ 12 برای TSSو COD به ترتیب 99 و 77 درصد بودند اما این میزان کاهش در ولتاژ 9 به ترتیب 97 و33 درصد بودند. همچنین نتایج نشان داد که pHنخستین پساب نقش مهمی را در کارآیی فرایند ایفا می‌کند به گونه ای که در محدوده pH خنثی میزان TSS و COD کاهش بیشتری را در فرایند نشان داد. نتایج این تحقیق نشان داد که روش الکتروکواگولاسیون می‌تواند به عنوان یک روش ساده و موثر برای تیمار پساب کارخانه های بازیافت کاغذ و کاهش آلودگی از آنها مورد استفاده قرار گیرد. 1- Ali, M., Sreekrishnan T.R., 2001. Aquatic toxicity from pulp and paper mill effluents: a review. Advances in Environmental Research. 5, 175–196. 2- APHA, Standard Methods for the Examination of Water and Wastewater (1989) 17th edn, American Public Health Association/American Water Works Association/Water Environment Federation, WashingtonDC, USA. 3- Chen, G., 2004. Electrochemical technologies in wastewater treatment. Separation and Purification Technology. 38, 11–41. 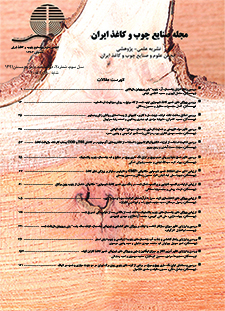 4- Daneshvar, N., Khataee, A.R., Amani Ghadim A.R., Rasoulifard, M.H., 2007. Decolorization of C.I. Acid Yellow 23 solution by electrocoagulationprocess: Investigation of operational parameters and evaluation of specific electrical energy consumption (SEEC). Hazardous Materials. 148, 566–572. 5- Khansorthong, S., Hunsom, M., 2009. Remediation of wastewater from pulp and paper mill industry by the electrochemical technique. Chemical Engineering Journal. 151, 228–234. 6- Mollah, M.Y.A., Schennach, R., Parga, J.R., Cocke, D.L., 2001.Electrocoagulation (EC)—science and application. Hazardous Materials. 84, 29–41. 7- Pokhrel, D., Viraraghavan, T., 2004.Treatment of pulp and paper mill wastewater-a review. Science of the Total Environment. 333, 37-58. 8- Ragunathan, R., Swaminathan, K., 2004. Biological treatment of a pulp and paper industry effluent by Pleurotus. W. J. Microbiology and Biotechnology. 20, 389–393. alternative method to chemical coagulation in water treatment. In: Eighth Annual Environmental Engineering Research Event (EERE) Conference, 6th–9th. 10- Ugurlua M.,Gurses A., Dogar C., Yalcın M., 2008.The removal of lignin and phenol from paper mill effluents by electrocoagulation. Journal of Environmental Management, 87(3), 420–428. 11- Zaied, M., Bellakhal, N., 2009. Electrocoagulation treatment of black liquor from paper industry, Journal of Hazardous Materials,163, 995–1000. 12- Daneshvar Nezam, Oladegaragoze Ali and N. Djafarzadeh,2006, Journal of Hazardous Materials, 129, 116-122. 13- Cecen, F., Urban, W., Haberl, R., 1992, Water Sci. Technol., 26, 435–444. 14- Kalyani, K.S.P., Balasubramanian, N., Srinivasakannan, C., 2003, Decolorization and COD Reduction of Paper Industrial Effluent UsingElectro-coagulation,Chem. Eng. J., 151, 97-104.